Now that Ebola is ravaging parts of West Africa, a nasty meme is once again rearing its ugly head — the suggestion that epidemics are "nature's way" of dealing with overpopulation. But it's an assertion that's as false as it is dangerous. Here's why. Image by Jim Cooke, source photos via Shutterstock. Warnings of human overpopulation have a storied history, but much of it can be traced back to Thomas Malthus. In his Essay on the Principle of Population, he claimed that human population would eventually be checked by famine and disease, leading to a so-called Malthusian catastrophe. His ideas were revived in the 20th century, leading to the rise of the Neo-Malthusians, a group that included William Vogt (author of Road to Survival), John B. Calhoun (famous for his mouse experiments and the term "behavioral sink"), and William and Paul Paddock (authors of Famine 1975! America's Decision: Who Will Survive). Once again, it became fashionable to worry about the population bomb. Years later, these ideas still trickle around the memesphere. Take the recent comments by Jean-Marie Le Pen, founder of France's far-right Front National. He claims that viruses will sort out the "demographic explosion," and by extension Europe's "immigration problem." "Monseigneur Ebola could sort that out in three months," he said in front of journalists. While Le Pen remains on the political fringe, these ideas, sadly, do not. There's this notion that diseases and epidemics somehow serve to "check" and prune-back human populations — and that it's somehow a "natural" and built-in ecological process. But this isn't how viruses or ecosystems work. Worse, it's a misconception that has led to the victim-blaming of some of the most marginalized and vulnerable peoples on the planet; it's a disturbing sentiment that could conceivably be used to justify inaction when confronting epidemics. It is important to first of all establish what is meant by overpopulation. Ecologists have their own way of defining overpopulation. Importantly, population density does not lie at the heart of this definition. Those countering warnings from scientists that the Earth is currently overpopulated often provide us with population density statistics such as, "all 7.2 billion humans could fit within New Zealand at a population density matching that of Manhattan's." Although they may find such statistics reassuring, it represents a common misunderstanding of what's actually meant by overpopulation. For ecologists, population density is quite irrelevant. Ecologists define overpopulation in terms of what the environment can "carry." Thus the term "carry capacity," which represents the maximum population size of the species that the environment can sustain without end. Therefore even an environment with a small population size could be considered overpopulated if the consumption of those individuals was not sustainable by that environment. humanity's collective demands first surpassed the earth's regenerative capacity around 1980. By 2007, global demands on the earth's natural systems exceeded sustainable yields by 50 percent. Stated otherwise, it would take 1.5 Earths to sustain our current consumption. If we use environmental indicators to evaluate our situation, then the global decline of the economy's natural support systems—the environmental decline that will lead to economic decline and social collapse—is well under way. Regardless of the accuracy of such estimates (e.g., it doesn't take future social, political, and technological efforts into account for decreasing the size of our global footprints), it is clear that our current levels of consumption are not sustainable, and therefore our population has exceeded the carrying capacity of the Earth. It is of course possible to change the carrying capacity of the Earth without having to alter population size. As an example, the invention of agriculture corrected the carrying capacity of the Earth to a significantly higher population number. As it stands now however, our Earth is indeed overpopulated by humans. But there are limiting factors that curtail the growth of population size. A major limiting factor is intraspecific competition — that is to say, competition between members of the same species for resources. Intraspecific competition acts on birth rates and death rates such that the two rates are equal and there is no net change in population size. In this way, it makes population sizes of natural populations self-correcting. That being said, limiting factors such intraspecific competition no longer apply to humans. We redistribute resources and share amongst our population regardless of the fitness level of the individual. Human advancement in social infrastructure, for example in such areas as our medical system and urban sanitation, makes the concept of limiting factors non-applicable to our population size. Dutch botanist and microbiologist Lourens Baas Becking once hypothesized "everything is everywhere, but the environment selects." While there is no such thing as viral ubiquity (i.e., every virus is not everywhere), one thing is for certain: our planet is absolutely teeming with viruses. In an article in Nature, Berkeley researcher C.A. Suttle suggested every living thing in our oceans is infected with a virus, and estimates the total virus population in the entire biosphere to be 1031. That is far more than there are stars in the universe, and if stretched end-to-end, these viruses would span farther than the nearest 60 galaxies. Every second, 1023 viral infections occur in the ocean. Indeed, their potential for dispersal is truly amazing — even without vectors. Viruses can be transported by water or atmospheric currents across the globe and at extremely rapid rates. Microbiologist Dale W. Griffith, in an article in Clinical Microbiology Reviews, found that viruses can travel great distances in clouds of desert dust; indeed it would even be possible for a virus can travel from Africa to South America in a single day. Like it or not, we are surrounded by viruses. This fact remains true whether a population is large or small. Viruses have accompanied us through time, and even shaped our own evolution. It's like a constant arms race that has lasted billions of years, and is ongoing each day of our lives. As an example, we devote considerable resources to preventing infection and maintaining our immune systems as a result of the selection pressures that viruses place on us. As University of New York researcher John J. Dennehy points out in an article published this month in the Annual Review of Microbiology, our interactions with viruses have carved our immune systems into what they are today, including fundamental ecological processes such as biogeochemical cycling, competition, community structuring, and horizontal gene transfer. Dennehy goes on to write that the ABO blood groups and the major histocompatibility complex, both major aspects of our immune system, would not exist if not for viruses and our interactions with them. Indeed, many viruses actually confer benefits to living things instead of harming them. There is even evidence, for example, that viruses have endowed humans with certain protections. Hannover Medical School researchers reported reduced mortality in HIV infected patients that were also infected by a second virus called GB Virus C.
Viruses are not all killer machines hiding in obscure corners of the Earth, just waiting to pounce on us as soon as we uncover them. 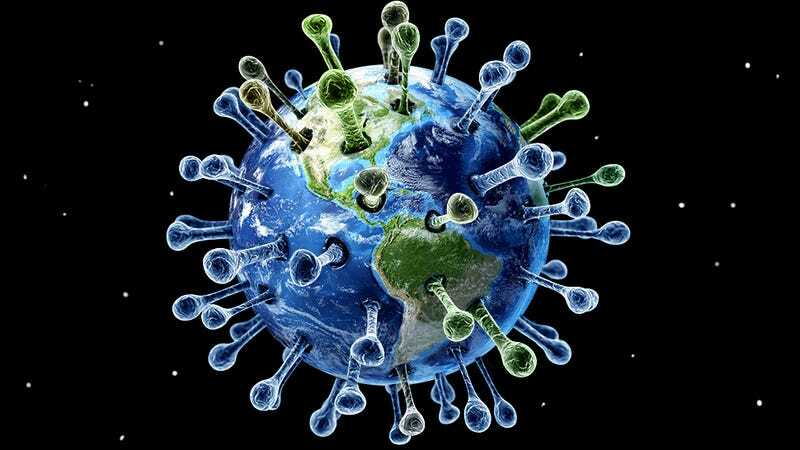 Viruses are distributed across the biosphere. Moreover, viruses can afflict communities of animals in which there are small numbers of individuals. Even if there are populations of animals restricted to rare habitats, there are specialized viruses whose distribution would closely match those populations. There is presumably nowhere to hide. Some of them do kill us. The question of why all of them don't, and why they haven't deleted all life from the planet (they've already had more than three billion years to do so) is something that must be answered in the context of viral fitness. Just as species compete with each other for resources, viruses compete with each other as well. Dennehy, is his review of viral ecology, provides a fascinating description of some of the hardships viruses must endure while interacting with other viruses. Some viruses can block coinfection by another virus. Others can produce proteins that disrupt the reproduction of the virus that they are competing with. Influenza B acts antagonistically with Influenza A. Therefore, there is a reduction in virus load during coinfections, since both viruses interfere with the transmission of each other. Also, this means there is no reassortment with Influenza A and B which prevents them from combining to form a super strain that would be really harmful to humans. Another consequence of viral competition is that when a virus tries to colonize a new geographic area, it might be outcompeted by an endemic virus via interference. This may explain why we do not find all viruses everywhere. Viruses must also fine tune how virulent to be. Natural selection acts to maximize the spread of the virus, not to maximize harm to the host. If causing serious harm to the host decreases rate of transmission, then natural selection will not favor it. Dennehy provides the example of the myxoma virus in Australia that had a 99% mortality rate in the rabbit population. Subsequent strains with a mortality of 50% were more successful since they allowed the rabbits to survive to spread the virus. A virus functions to transmit itself as much as it can, not necessarily to kill the host. A killer virus is selected against since killing all of the hosts makes transmission of the virus problematic. Disturbingly, and further to the argument that there's no population control mechanism embedded within ecological processes, the Deformed Wing Virus (DWV) via the parasitic Varroa mite appears to be so virulent that it has resulted in the total extinction of bee populations within closed ecological areas, namely in Hawaii. In rare cases like these, a virus is too virulent for its own good. Indeed, studies of island epidemics are quite fascinating. There was a 150-year study of measles in Iceland from 1840 to 1990. Over the 150 years, there were 19 distinct epidemic waves. Doctors kept very precise records, which allowed the spread of the measles to be studied very closely. Transmission of the virus across Iceland became more rapid in subsequent waves as travel and population increased. However, more frequent introductions of the virus meant less time for susceptible populations to grow. So even though outbreaks became more frequent in different locations, they materialized as small outbreaks instead of the earlier massive epidemics. It is possible that this trend will continue in the future, with frequent but small and contained outbreaks. Christopher Wills writes in his book Yellow Fever Black Goddess: The Coevolution of People and Plagues, that plagues will not impact human overpopulation, and that like it or not we will have to address the problem of overpopulation independent of that. It is too simplistic to believe that populations rely on viruses to thin down numbers in populations that have exceeded carrying capacity. It would be like a plant evolving to rely on tornados for seed dispersal. Tornados are so rare and random in where they appear, it would hardly be a reliable mechanism. What's more, given that limiting factors to natural populations have become such a complete non-factor to human population growth, it seems even less likely to become so as human advancement moves forward. The truth of the matter is that viruses have been with us since the very beginning. They've shaped many of our traits. They've even conferred to us some adaptive advantages. Just like cellular-based life, viruses have to compete. That very well may mean the virus being less virulent to maximize its transmission. Whatever the case, it is too simplistic to view viruses simply as a mechanism to thin population numbers. In this respect, Christopher Wills makes a strong argument: if one agrees that we have exceeded the carrying capacity of the Earth, it will not be a virus that brings our population size into a stable equilibrium. Something else that's worth discussing are the sociological factors driving this fallacy. As the Ebola epidemic spreads in West Africa, it has become all too convenient for some people in the more privileged parts of the world to point to overpopulation as the cause and to epidemics as the prescription. Such views, and as exemplified by the hateful comments of Jean-Marie Le Pen, are unscientific, undemocratic, misanthropic — and at times flat-out racist. Think about it this way: If an epidemic began ravaging parts of North America or Europe, do you think we'd consider it "natural"? Hardly. Further, these sentiments only serve to undermine the plight of people caught in epidemics. In the case of West Africa, Ebola may be the immediate cause of death, but it's clear that poverty, along with the excruciatingly slow international response to the crisis, are the real killers. Please consider donating to West Africa Ebola relief via Doctors Without Borders. Special thanks to Julia Hemphill for assisting us with this article.